Description of Property: Valencay near Tours and Poitiers. Kitchen - large room fully equipped with pots and pans and new appliances (dishwasher, fridge freezer, washing machine, cooker, microwave, coffee machine, toaster, kettles). 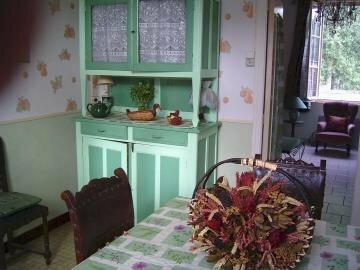 Light oak cupboards and work surfaces, antique buffet, refectory table and 6 matching chairs. The kitchen leads onto the lounge. 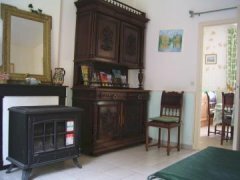 Lounge - large room comprising of an original fireplace coupled with a log burning stove which is especially warm and cosy in the winter, 2 sculptured carved wooden chairs, reupholstered antique sofa, and two matching armchairs, coffee table, television, home video and cassette player. Bedroom 1 - splendid double bedroom complete with Louis XVI bed and matching wardrobe, chair and mirror. Excellent quality new mattress (all the mattresses in the house are new). Bathroom 1 - good sized tiled bathroom with basin, bath tub with overhead shower, mirror. Bedroom 2 - beautiful large Master Bedroom: antique bedroom with matching armchair, table and wardrobe. Bedroom 3 - large twin bedroom furnished with 2 single beds, wardrobe and chairs. Bathroom 2 - luxurious large new tiled bathroom with walk-in shower cubicle, wash basin: there is storage facility for clothes and towels. Mezzanine - additional room, furnished with a sofa-bed which can be used as an additional bedroom or a second television room. Rear garden: terrace end: pink gravelled surrounded by lavender beds, table and chairs, barbecue. Orchard end: has an enclosed area laid to lawn suitable for children to play which catches the sun all day, and a wooden bench. At the bottom of the garden is a silver birch wood leading onto a small river which is a haven for birds (herons, kingfishers and all types of fish carp, perch, pike etc). There is ample car parking space behind the house and a private secure parking space next to the vegetable garden for 3 cars. Surrounding Area: The house is 4kms from the town of Valencay, famous for its Château entirely furnished, with Sight and Sound, daily shows with actors in full costumes in the Summer months. Around it is a French style garden with box topiary and ornamental lakes, a hunting lodge and and 70 hectares of parkland with some animals. The town boasts also of the Musée de l'automobile, the museum of the sugared articraft. Valencay is renowned for its pyramid goat cheese and wine. Its vineyards extend over 150 hectares. 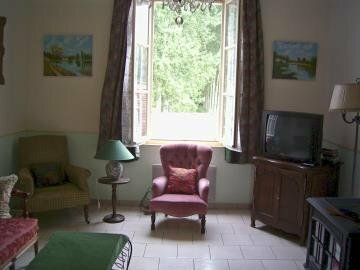 The house is an ideal base for exploring the numerous Châteaux of Val de Loire, Chenonceaux, Villandry, Chambord, Chaumont, etc, which can also be discovered from hot air balloons. 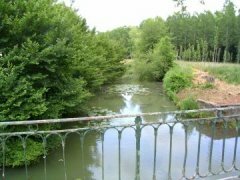 Situated 10 kms from Selle sur Cher which borders the huge marshy hunting area of the Sologne, the surrounding countryside is a scene of gently rolling hills and vigorous sparkling rivers. The nearby picturesque villages have a flavour of old world charm such as Levroux, Chatillon sur Indre, Villentrois. There are cave dwellings, mushroom caves and an incredible carved town inside a cave in Bourre, near Montrichard. The old towns of Blois, Amboise, Tours and the famous cathedral cities of Bourges and Chartres are all easily reached by car. The old medieval town of Saint Aignan and its zoo is only 12kms away. Poitiers and its futuroscope is linked by rail to Valencay and is 2 hours drive from the house. The area of Valencay offers 250 kms of signposted paths for ramblers, horse riders and cyclists. 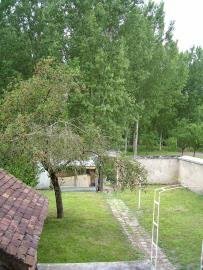 There are 18 short walks adapted for children each with a theme, (the forest, the dolmens, the vineyards, the parchmin). In the a south of Valencay is the Brenne Regional Nature Park with more than 2200 lakes, a renowned destination for numerous species of migratory birds which can be explored on foot, bicycle or horseback. Electric storage heaters. Wood burning stove and fireplace. Mains water. Septic tank. Electricity. Television. DVD. Hi-fi. Toaster, Coffee machine, Sandwich toaster. Pricing Info: Prices are in £ (UK Pounds). The price is £450 per month for Winter lets from October to March inclusive. Further periods can be negotiated. For shorter lets it is £270 to £475 depending on season. Linen available at no extra cost. House cleaning-up: 35 euros. Logs are available at a nominal fee. Two month’s rent are required as security deposit. A deposit of one month’s rent is required to book the place. Added charge for electricity based on usage. French, Spanish, Italian, German, English.